Dust Spot Removal Made Easy In Lightroom 3. 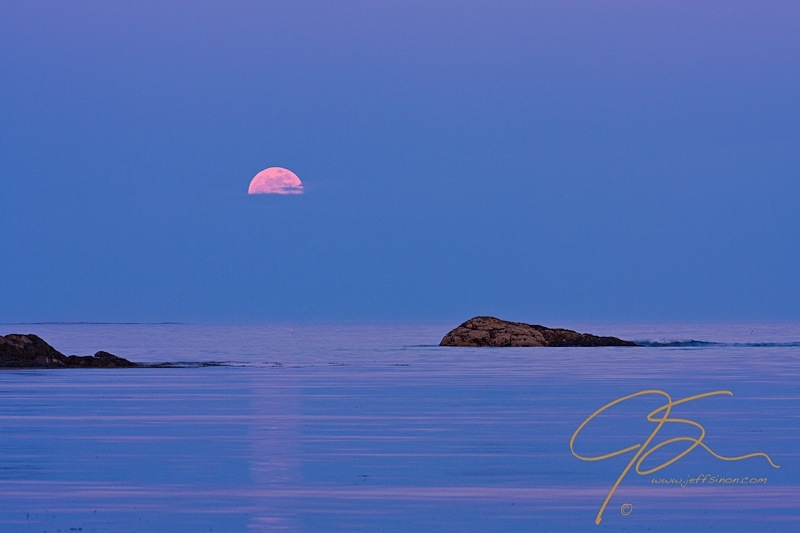 Yesterday I headed down to Odiorne Point State Park to photograph the May 5th “Super Moon” full moon. 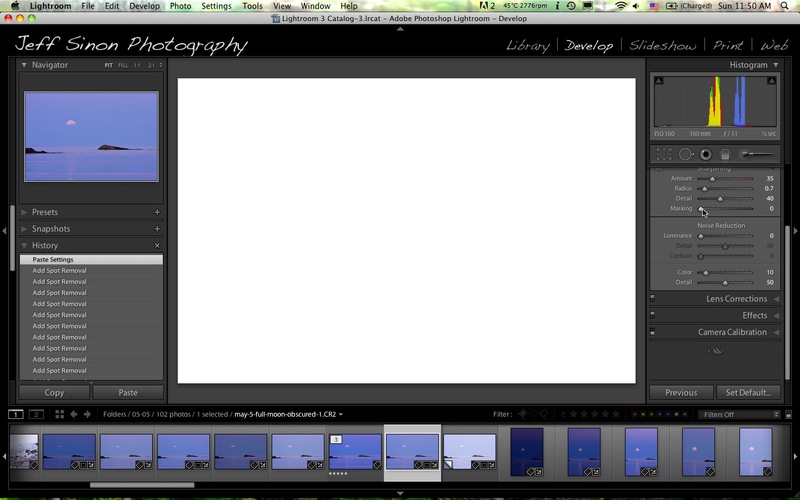 After importing the images into Lightroom 3 one thing became abundantly clear, the sensor in my camera is filthy! The spot removal tool in Lightroom works very well for, you guessed it, removing dust spots, but sometimes the spots themselves can be faint, hard to see, and therefore easy to miss. Many times I thought I was finished cleaning up a photo, only to notice a dust spot that I had missed, occasionally after the image had been shared online. Ooops! Here is a trick I use to get rid of those hard to see spots, it’s something I stumbled upon completely by accident while sharpening my images. Though I currently use Lightroom 3, and I don’t know for sure, I assume the same technique will work in LR4. It works wonders too, especially for those hard to see dust spots. 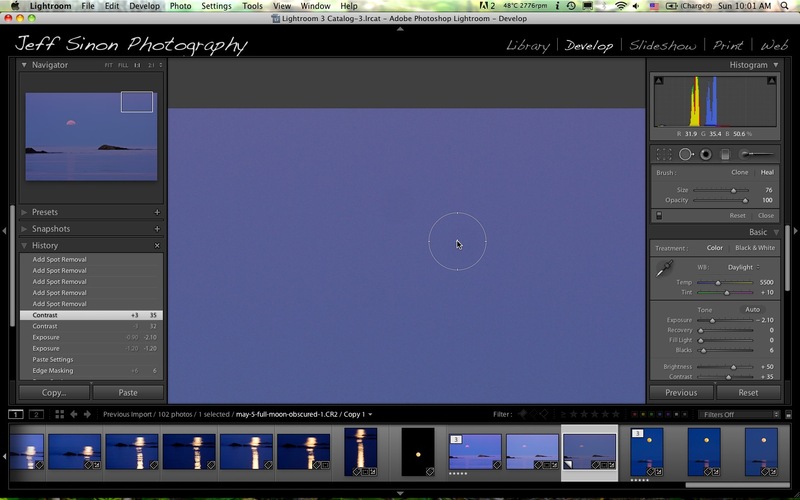 It also saves me from the tedious task of zooming in 100% and going over every inch of the image looking for them. It works so well in fact, that I’ve decided it was worth sharing. Open the image in the develop module. Depending on your monitor, you may be able to see some of the dust spots in the image below. There is a pair of obvious ones in the upper right of the un-edited RAW image below, just below the line between Library and Develop. If you can’t see them here, don’t worry, you’ll see them easy enough in the next few steps. 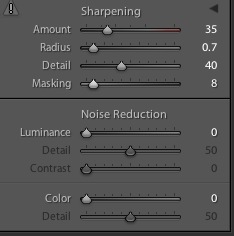 Next, scroll down and open the Detail panel and apply whatever sharpening settings tickle your fancy. For my spot removal technique, the first three sliders, Amount, Radius, and Detail are pretty much irrelevant as long as you have at least some sharpening applied. The Masking slider is where the magic will be happening. For what it is worth, the settings you see on the first three sliders are the settings I use as a starting point on every image I import into Lightroom. For most, this is all the sharpening they get. With the Detail panel open and visible on the right, open the Spot Removal tool, keyboard shortcut, Q (on a Mac at least). It’s the second tool from the left in the tool panel, on the right side just below the histogram, the one that looks like a circle with an arrow sticking out the side. For this technique you then want to select the “Heal” option. Using the Masking slider, and a trick most should be familiar with for selectively sharpening images in Lightroom, press the Option key (alt on a PC) and the Masking slider (set to zero) at the same time, and your image should go white like this. “But why does it look like someone took a shotgun to your image?” you might ask. Those circles plastered all over the image, those are dust spots, I told you my sensor was dirty! You can also see a few birds flew through the frame as indicated by the three white “dashes” down toward the horizon. We’ll be getting rid of those too. Step Five. Cleaning Up Your Camera’s Dirty Mess. This last step requires good eyes and a good memory. As soon as you release the Option (alt) key, or the Masking slider, the image reverts to normal, so you have to remember where those spots were. Some will be easy to see, while others can be tougher. The pair of spots I mentioned earlier, just a bit below Library | Develop, were obvious, the rest were much less so. In the screen capture below you see the area indicated in the preview on the upper left, zoomed to 100%, with a dust spot just one click away from dust spot heaven. Then after allowing the image to revert back to normal, I zoom in 100%, select the Spot Removal tool (keyboard shortcut Q), set the size to just a bit larger than the spot, and click that little bugger into oblivion! A spot free image ready for your further post processing handy-work. A Few More Tips And Tricks. Remove all spots with the image zoomed at 100%, they are easier to see, making removal more accurate. Reducing the exposure a stop or so can help see the harder to see dust spots. Set the Spot Removal tool to a size just a little larger than the spot you are getting rid of. This technique works best when trying to clean up spots in open areas like the sky or water, areas without a lot of detail, away from the edges of objects in the scene. Since the Spot Removal Tool uses the surrounding area to “heal” away the spot, if the spot is very close to an edge of something, like the moon or the rocks in this case, it may pick up some of the moon or rocks to “heal” with and then you’ll have an errant slice of rock, or moon, floating in the sky. I’ve found setting the tool to Clone and cloning them out to work better in these cases. 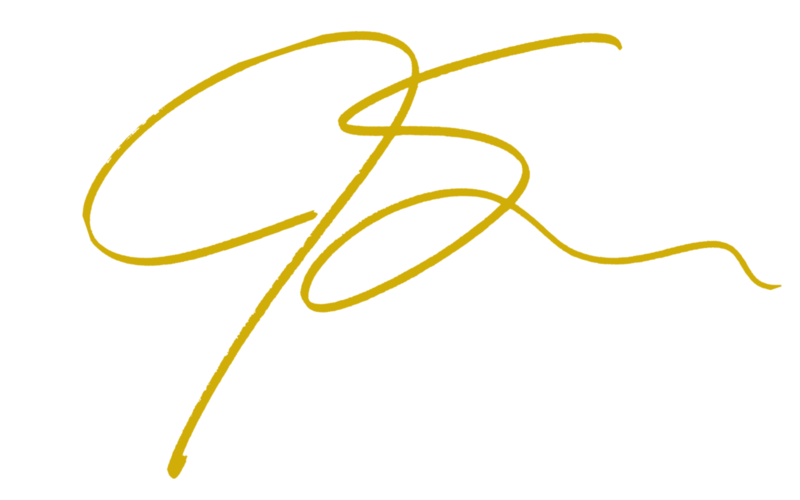 I have also found that grabbing the image and moving it a little helps because sometimes the spot stands out better when the image is moving. The next time, after you clean up an image the old way, by zooming in and going over every pixel looking for spots, try this technique and you may be surprised at what you missed. And just how dirty your camera’s sensor really is! Thank you for explaining! I don’t use Lightroom–all I have at present is the “Snapseed” app which is fabulous on iPad. I need an app that lets me do this without having to buy something big like lightroom…I’m totally thrilled with Snapseed because I don’t normally do a ton of editing on my photos, so Snapseed works great. It even has some pretty cool options, like my “sun” picture of the Statue of Liberty that has all the colors to it. Thank you for the tutorial. I will keep looking for an app that has a “heal” option! 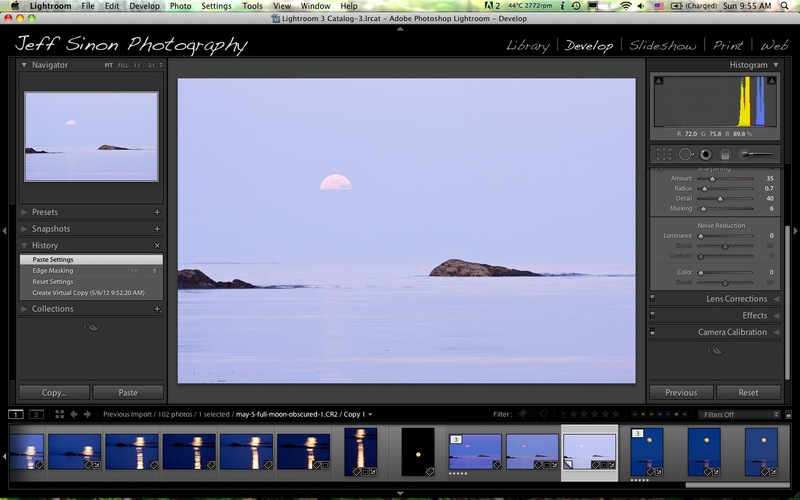 I think you would love Lightroom! 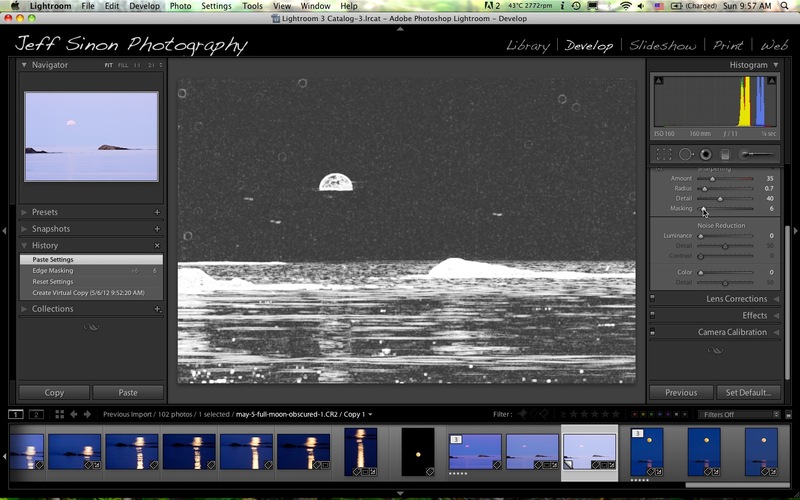 It is very intuitive, unlike Photoshop, and geared towards photographers. As a teacher you would be eligible for the academic pricing too, which I think is $100. Very well worth it if you ask me. My biggest concern, other than the cash, is my 5YO vintage MacBook. I have yet to upgrade to the next OS, and it already gets tired and grumpy on me. By the time I have enough money put aside for a new laptop, I’ll be using it for a new Canon instead!! Yes, but only because they keep coming out with such nice little goodies. How did I ever get along without my iPad, for example?? If you get the chance, you will love Lightroom. Very intuitive and geared towards photographers. For someone like me to find it easy to use, it must be easy! Sticking with what works isn’t a bad idea at all! I googled “Lightroom dust spot removal” after I posted this(probably should have done it before), and did come up with one reference to a variation of “my” technique. I think my article was a little more informative, if only for the screen shots. I was very happy with my “accidental” discovery. As I usually do dust spot removal early on in my PP, and sharpening last, I was thinking “what the hell are those little circles?” as I was applying the sharpening mask. That’s when the “Eureka” moment struck. Excellent tutorial Jeff. I just started using Lightroom. My main image editor has been Photoshop for many years, but I decided to try Lightroom and I don’t know much about the program, so this was very helpful to me. Thanks Carinal! I’ve only played around in Photoshop a little bit. Lightroom is so much more intuitive to me, and right now is pretty much my only image editor along with all of the Nik plug-ins. http://www.niksoftware.com/index/usa/entry.php? Every image I create goes through Color Efex Pro, and for black and white, Silver Efex is the only way to go. ← Weekly Photo Challenge: Unfocused.